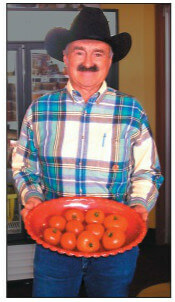 He represents Vic Mauro Produce, run by his youngest son. Another son Nick is one of the few hog farmers still left in Colorado. The family’s farm stand is located 8 miles east of Pueblo on Highway 50. “In June, we’ll be in full swing again,” Joe says. Thanks to the greenhouse, the Mauro family is able to have some very early season tomatoes and lettuces. They also raise chiles, sweet corn, and pinto beans, which are available for purchase at Ranch Foods Direct. They have a strawberry patch and are known for their strawberry preserves, which Ranch Foods Direct also carries. And their popular salsas — heavy on the chiles, lighter on the tomatoes — are forever at risk of being sold out. “They are not overwhelmingly hot, but just so flavorful,” says Ranch Foods Direct retail manager Kindra Dale. Joe says they raise nine different varieties of chiles. “Pueblo chiles have a very good taste,” he says. The Mauro’s are actively involved in Pueblo’s downtown chile festival, always held the third Saturday in September, which fills the air with the smell of roasting chile peppers. The Mauro family has been raising hogs since 1954. They have 150 sows and sell breeding stock and show pigs. Their business is getting tougher because lifestyles are changing. “The people who know us still support us, but they are getting older and don’t eat as much and the younger people don’t come to us like their parents did,” Joe observes. People used to flock to their pick-your-own strawberry patch but over the years they’ve shown less interest in going out into the fields to gather the fruit, choosing the convenience of picking up crates at a store instead. Arkansas Valley farmers are increasingly a dying breed. Many have sold their water rights to municipalities. Joe worries that Arkansas River water for irrigation will eventually decline. “Twenty seven percent of the ditch water has been sold to Pueblo,” Joe says. Fortunately, last year was an exceptionally good year for moisture. But so far this spring the snowpack is at 80 percent. “It has been colder this year than it has been in a long time,” he adds. Local farmers need the support of surrounding communities to remain viable. While at Ranch Foods Direct, be sure to sample products from the Mauro family and other area farmers.